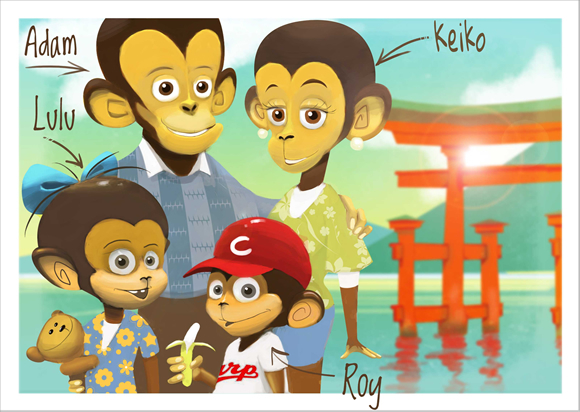 First, here’s a picture of us, posing in front of the famous shrine gate in the waters of Miyajima, not far from our home in Hiroshima, Japan. My interest in children and bilingualism actually started several years before my own kids were born. Shortly after I came to Japan in 1996, I began teaching English and Drama at Hiroshima International School. Here I had the chance to work with bilingual children of all ages and this led me to explore the “best practices” for nurturing good bilingual ability throughout childhood. In 2002, I left Hiroshima International School to become a freelance writer and teacher. But my ties to the school have continued over the years with Bilingual Kids, a private tutoring program I began to address the needs of bilingual children in Hiroshima. Originally, I’m from the United States, from Quincy, Illinois, a small city on the bank of the Mississippi River. After high school, I went to Sarah Lawrence College, on the outskirts of New York City, and then San Francisco State University for graduate school. I was also a Peace Corps Volunteer in the Czech Republic, where I taught English for two years at the University of West Bohemia in the city of Pilsen. Currently, Lulu is 14 and Roy is 11. Since the very start, Keiko and I have each used only our mother tongue to communicate with them—a strict version of the OPOL approach (one person-one language). This choice, along with extensive exposure to English through the range of efforts I write about—especially, through books and reading—has enabled Lulu and Roy to develop good proficiency in both their languages, despite the fact that they have always attended Japanese schools. At this point, their bilingual ability, in all skill areas, is strong and well-balanced. To learn more about my family, and the efforts I’ve made to nurture my children’s minority language, you might begin with 19 Things I Haven’t Told You About Me and My Family, then browse through the posts within the My Family category. Or head straight to the Quick Start guide for a handy list of popular articles.